After reading this article and with the help of actual html tags with example shown, you will get to know about best meta tags for SEO, and also able to get the answers to the questions of what are Google tags affect SEO? How to define metadata for the post? Know the details about SEO description & SEO HTML code of each page, how to write meta elements for each blog post in blogger or WordPress and how to improve PageRank by qualifying SEO purposes by generating meta property. Meta definition —in simple words, meta keywords (also treated as Google keywords) are the descriptive keywords or list of keywords written in HTML or XML code and are specially used for providing the fundamental short information called as SEO description about the structured description of the site page; so it is also treated as "HTML keywords" and the description is names as meta content description. Specifically, every blogger used to define metadata & SEO description in the section of each page. For better html5 meta tags best practice; the SEO site description & metadata SEO is grouped by the combination of many elements like post content, labels (say keywords), the title of the post and some portion or say a short abstract of the post. There are lots of varieties of meta keywords including Facebook meta tags, DC Dublin Core meta tags, Twitter meta tags. Such meta-information is the most important factor for any website to get higher search ranking in SERP. For those who ask "should I use meta keywords in a website" my straight answer is YES, you must use the мета tags and SEO description tag while publishing a new post. Last time you have seen, 15 Ways To Improve SEO Ranking Fast That’ll Generate Huge Traffic To Your Site and today I am going to share all about how to increase SEO by defining metadata process, SEO description for getting higher Google ranking. Do tags help SEO? —For every blog post, the meta elements are used to describe the contents of that page in a short description, and hence it will help search engine to know easily about the actual and accurate information of that particular page. If you have noticed while you searching something on Google search, it will not only show you those keywords you searching about, but also the link, title and some description which also consists the key words you were searching about. This webtag is nothing but meta tags and it is only because of SEO meta description you added while publishing the page. It's only because you define meta elements and that SEO descripton for each page so the Google search engine will index the pages as quick as possible. 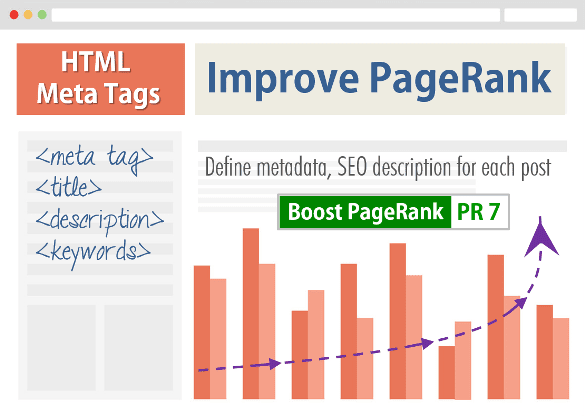 Moreover, these, meta tags & SEO page also helps the engine to find some part of post, which causes the more organic traffic to your website page directly from any search engine. Should I use meta keywords? —Lots of bloggers are eager to use [automated] dynamic meta tags in their blog, but in reality it doesn't make any sense rather it work in opposite to what we thought for. Check out to get more detailed on Stop Using Dynamic Meta Tags | Advanced SEO Practice that will hurt SERP. Before go further, one point should be noted that, whenever you go to write the SEO tags for website, make sure that the description should be actual high-quality descriptive content according to the page description. Since the meta information is significant, don't make redundant data (repetitive data) for getting promoted into search engines. Always try to provide correct information, which accurately describe the particular page about which the meta tag is being built. And ultimately, these SEO title description keywords help you to rank higher in Google search results. According to the latest Google algorithm the SEO meta description and other meta tags and keywords are the fundamental elements considered for measuring website ranking. These html SEO meta tags not just help Google, but the searcher to get the quick info about your page and website. There are lots of website meta tag checker to use to check your tags. Many used to find google meta tag generator online but failed to find as Google don't have such a tool to use. So check out the details about the actual SEO tags for website that shows how you can add google meta title for each page and how to insert other html web tags in the code section of website. 1. Go to your template HTML editor. 2. And ‘Expand Widgets Templates’ to see full source code of your HTML. 5. In above meta tags and keywords pattern you have to just change the colored lines with your own data. Building the meta keywords for the particular post or site is a very easy part, but in case the blog or site contains so much of posts or pages then it will become more lengthy work to do. Free SEO Tool NOTE: Once you add these html SEO meta tags to your pages, it may take some time for changes to appear in the index and for crawling entire website. The meta keywords are really helpful to bring more traffic to your site within a shorter period of time & gets much improved PageRank. NOTE: If you use latest blogger template then you need NOT required to add the description and title in every page manually as the blogger auto adds all the info inside the HTML for you.